The central bank is debating an exit from its record monetary stimulus. A hasty move would risk a repeat of its mistimed 2006 decision to end quantitative easing. Investors think the talk is little more than hot air. Yet any change in expectations could be self-fulfilling. An informal debate is under way at the Bank of Japan on how to prepare for an exit from the central bank’s “quantitative and qualitative monetary easing programme,” Reuters reported on May 27, citing current and former central bankers familiar with the discussions. Under the stimulus, which was launched in April last year, the BOJ vowed to double the monetary base as well as the amounts outstanding of Japanese government bonds (JGBs) and exchange-traded funds (ETFs) on its balance sheet in two years. Bank of Japan Governor Haruhiko Kuroda told the Wall Street Journal in an interview published on May 23 that the central bank is on its way to achieving its target of 2 percent inflation, but unless Prime Minister Shinzo Abe follows through on structural reforms, “the real growth rate may be disappointing.” The Bank of Japan currently projects inflation of 1.9 percent during the fiscal year starting April 2015, and 2.1 percent for the following year. 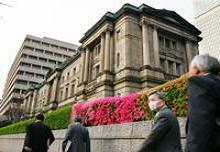 The yield on 10-year Japanese government bonds was 0.57 percent on May 29, compared with 0.93 percent a year earlier.